Because of the high cost of rapid prototyping equipment and the high level of technical expertise required to reliably produce perfect parts, the trend is to use specialized third-party service bureaus. 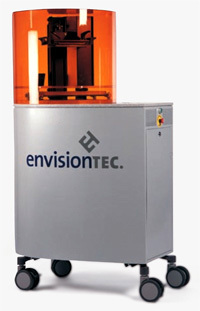 Our systems reduce cost and time-to-market by translating CAD Designs into hard copy 3D models. These models are so accurate that designers can go beyond concept modeling to produce tooling grade patterns ready for casting or mold-making. In many fields, there is great uncertainty as to whether a new design will actually do what is desired. New designs often have unexpected problems. A prototype is often used as part of the product design process to allow engineers and designers the ability to explore design alternatives, test theories and confirm performance prior to starting production of a new product. Engineers use their experience to tailor the prototype according to the specific unknowns still present in the intended design. For example, some prototypes are used to confirm and verify consumer interest in a proposed design where as other prototypes will attempt to verify the performance or suitability of a specific design approach.